Lichocka, M. (2014). Biolistic Bombardment for Co-expression of Proteins Fused to YFP and mRFP in Leaf Epidermal Cells of Phaseolus vulgaris ‘Red Mexican’. Bio-protocol 4(1): e1019. DOI: 10.21769/BioProtoc.1019. Giska, F., Lichocka, M., Piechocki, M., Dadlez, M., Schmelzer, E., Hennig, J. and Krzymowska, M. (2013). Phosphorylation of HopQ1, a type III effector from Pseudomonas syringae, creates a binding site for host 14-3-3 proteins. Plant Physiol 161(4): 2049-2061. Biolistic bombardment is based on coating of tungsten or gold particles with DNA and delivery of these “biobullets” into living plant cells under high pressure (Sudowe and Reske-Kunz, 2013). This method enables transient expression of a DNA construct encoding fusion of the protein of interest to a fluorescence protein e.g. GFP for microscopic approaches. Usually it is performed for plants for which infiltration with Agrobacterium tumefaciens does not work efficiently e.g. model plant Arabidopsis thaliana (Ueki et al., 2009). Although transfection rate is relatively low, it is still sufficient to analyze subcellular localization of the protein of interest under a fluorescence microscope. Here we present the protocol that was optimized for Nicotiana benthamiana and also successfully applied to Phaseolus vulgaris (Giska et al., 2013). Weigh out 50 mg tungsten into 1.5 ml microfuge tube. Note: Tungsten particles, 1.1 μm diameter, easily stick to the plastic. We recommend weighing out of the tungsten directly into microfuge cap, formerly cut out from the tube, to avoid wasting of metal powder. For surface sterilization of tungsten add 1 ml 96% ethanol and vortex vigorously for 2 min and spin for 5 sec in microcentrifuge. Discard ethanol and resuspend tungsten particles in 1 ml miliQ water. Vortex vigorously and spin for 5 sec in microcentrifuge. Discard water and repeat washing with water three times. Add 1 ml water and prepare 50 μl aliquots; continuous vortexing during aliquoting is necessary to sustain uniform sampling. Aliquots can be stored at -20 °C. Note: It is recommended to vortex the mixture continuously during whole procedure for uniform precipitation of plasmid DNA onto tungsten particles. Add 5 μl 0.1 mM spermidine. Plasmid DNA at final concentration ca. 2-4 μg (the amount of plasmid DNA can be increased up to 5-10 μg when working with large plasmids e.g. binary vectors). For co-expression of two constructs mix DNA in ratio 1:1 to the total 2-4 μg. Add 12 μl 2.5 M CaCl2 and allow the mixture to precipitate for 1 min at room temperature. Pellet microcarriers by spinning for 2 sec in microcentrifuge. Discard the supernatant and wash the tungsten with fifty μl 75% ethanol, after short spin remove supernatant and repeat washing with 100% ethanol two times. Spin for 5 sec in microcentrifuge after each washing step. Add twenty μl 100% ethanol and disperse the aggregates by vortexing and pipetting. If large aggregates are still visible, sonicate the samples. Note: Large aggregates may cause extensive damage of plant tissue during bombardment which significantly reduces transfection rate. Place macrocarrier inside macrocarrier holder using forceps. The edge of the macrocarrier should be securely placed at the bottom of the macrocarrier holder. When correctly inserted, it does not stick out and creates a flat surface at the bottom of the holder. Load 10 μl microcarriers coated with DNA on macrocarrier (Figure 1A). Try to spread them out through the center of macrocarrier surface with the use of a pipette tip. Avoid aggregation of tungsten particles in one place. Allow the ethanol to evaporate, leave the macrocarries for 10 min in a dry place. Figure 1. A. Macrocarrier coated with microcarriers (arrow), inserted into macrocarrier holder. B. Stopping screen (arrow) placed inside fixed next of macrocarrier launch assembly. C. Placement of inverted macrocarrier holder (arrow), with dried microcarriers facing down, inside fixed next of macrocarrier launch assembly. D. Placement of macrocarrier cover lid (arrow) onto assembled fixed nest. Cut leaves just before microbombardment and place them in a Petri dish with the abaxial side exposed for bombardment. Turn on the biolistic device, vacuum pump, open helium tank with the main valve, set the pressure with regulator to 200 dpi over the selected rupture disk burst pressure (using 1,100 psi rupture disk set it at 1,300-1,400 psi). Load the rupture disk into the retaining cup using forceps; screw retaining cup with the rupture disk onto the gas acceleration tube using left-to-right motion. It must be tightened sufficiently; otherwise the rupture disk may slip out as the gas acceleration tube fills with helium. Load the macrocarrier holder and stopping screen into the macrocarrier launch assembly (Figure 1B, 1C, 1D). Place the macrocarrier launch assembly into the bombardment chamber, set the distance gap between rupture retaining cup (Figure 2, we usually placed it at second position from the top) and close the door. 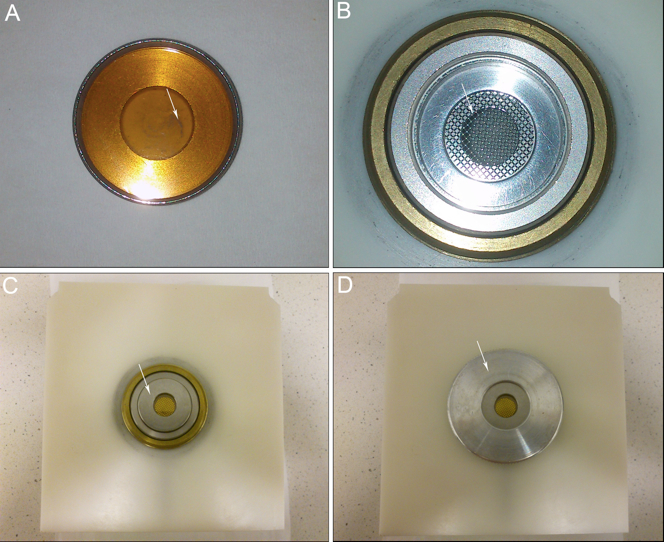 Place the opened Petri dish with plant sample on the target shelf inserted into second position from the bottom of the sample chamber (Figure 2). Hold vacuum at desired level (minimum 5 inches of mercury, we set it at 27.5). Bombard sample: keep the fire button pressed until rupture disk bursts and then release the fire button. Release the vacuum for the sample chamber. Remove the plant sample from the chamber. Unload macrocarrier launch assembly and rupture disk retaining cup. Close the main valve on helium tank and remove the helium form the system: set vacuum at 5 inches of Hg, keep the fire button pressed until the helium pressure in helium regulator reaches 0 level. Turn off biolistic device and vacuum pump. After bombardment place the leaves onto wet filter paper in Petri dishes and seal them with Parafilm. Keep in a dark place at room temperature for ca. 18 h. Usually 90-100% of transfected cells exhibit fluorescence of both fluorophores. It is recommended to examine first the tissue under fluorescence stereomicroscope to cut out leaf fragments with the highest density of transfected cells. Prepare 1 M spermidine stock solution in miliQ water. Sterilize the solution by filtration trough 0.22 μm syringe filter and store at -80 °C. Prepare 0.1 mM spermidine working solution by dilution of 1 M stock with sterile miliQ water. Prepare aliquots of 100 μl each and store them at -20 °C for up to 1 year. This protocol is based on the procedure described by Giska et al. (2013). Sudowe, S. and Reske-Kunz, A. B. eds. (2013). Biolistic DNA delivery methods and protocols. Methods Mol Biol Vol 940. Ueki, S., Lacroix, B., Krichevsky, A., Lazarowitz, S. G. and Citovsky, V. (2009). Functional transient genetic transformation of Arabidopsis leaves by biolistic bombardment. Nat Protoc 4(1): 71-77.